The 2014 California Nonprofit Technology Festival is happening April 3 and 4, 2014 in Los Angeles. Save the date for this participatory and community-driven two-day convening designed for nonprofit staff, grassroots and community organizers, social justice technologists, and those passionate about social change and technology. The agenda is co-developed with participants, facilitators, and partners in the time leading up and during the event. We'll address the technology challenges and opportunities faced in our communities and collaborate on strategies to build statewide technology capacity to support the work of social change. Participant-Led Sessions: More than half of the agenda will be built by participants before and during the event, covering topics, tools, themes and issues proposed by those present. More, more more! Tell us what other hands-on tech skills you would like to learn, and we'll try to find facilitators to get you there. Contact us and let is know what should be on the agendaand how we can make this event more relevant and valuable for you! Special thanks to the California Consumer Protection Foundation for their support in building technology capacity for grassroots organizations and consumers in California. 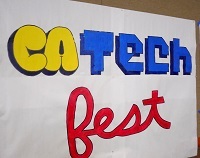 Check out what happened at the California Nonprofit Technology Festivals in Coachella, Fresno, and Sacramento.